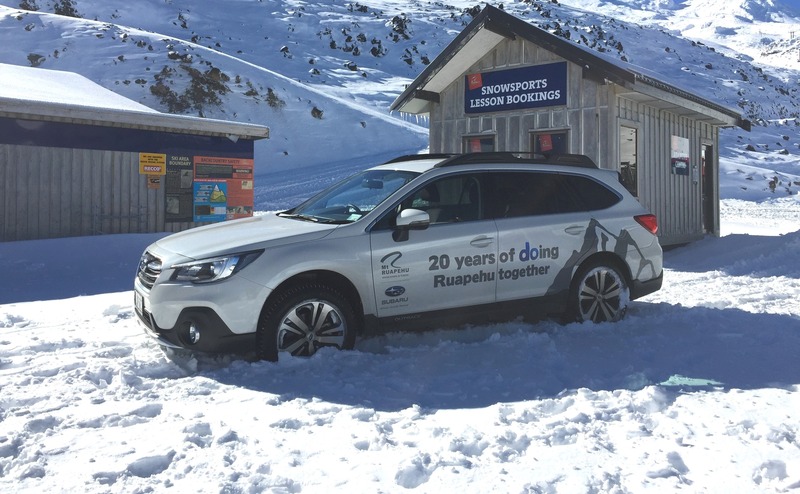 A Subaru Outback at the Turoa Ski Area celebrating the 20-year partnership between Subaru and RAL in 2018. 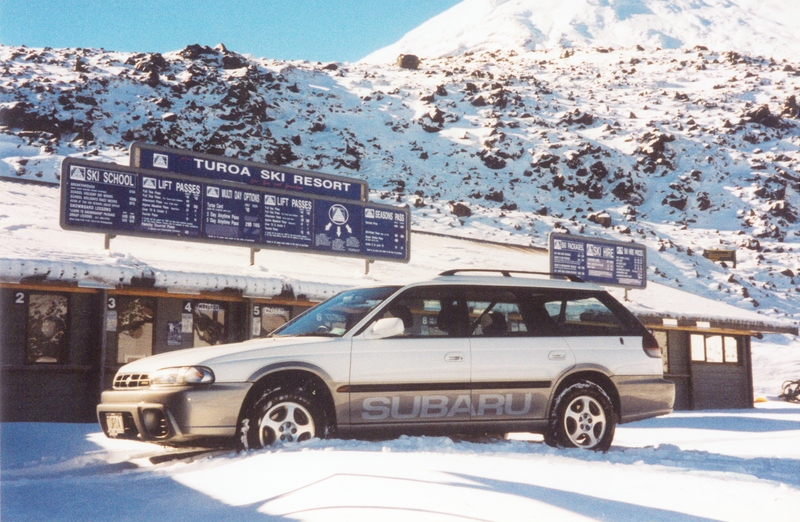 A Subaru Legacy at Turoa Ski Area back when the Subaru and RAL partnership first began in 1998. Subaru of New Zealand and Ruapehu Alpine Lifts (RAL) celebrate a momentous milestone in 2018 – 20 years of doing Mt Ruapehu together. This long-standing partnership has seen Subaru hold the role of the Official Vehicle Supplier to RAL since 1998, initially with Turoa, and with both Whakapapa and Turoa since 2000 when RAL acquired Turoa. Subaru’s Managing Director Wallis Dumper says the mutually-beneficial relationship is an example of a perfect match between two organisations. RAL Chief Executive Officer Ross Copland says the partnership is a celebration of an amazing synergy. "Twenty years is a long time in business today and it speaks to the character of both Subaru NZ and RAL – we have absolute trust in Subaru and the premium vehicle range they produce. Our partnership has endured for many reasons, a stand-out for us has been how well Subaru has adapted its product over the decades to ensure it remains the leading vehicle for accessing Mt Ruapehu in all seasons," Mr Copland says. “We’re looking forward to the next 20 years together and watching Subaru evolve its technology to meet the challenges of a changing world,” he adds. Subaru of New Zealand’s Marketing Manager Daile Stephens says the car brand is excited to have reinforced the partnership and has recently re-signed with RAL for another three years. This winter season there will be a fleet of Subaru SUVs enabling RAL staff to get up and down the mountain no matter the conditions. Although, Mrs Stephens says it is not just the RAL employees that will enjoy the benefits of Subaru’s engineering prowess over winter. “You only need to look in the RAL ski field carparks to spot how many Subaru drivers enjoy the invisible advantages of our All-Wheel Drive technology which equally distributes power across all four wheels meaning greater control,” Mrs Stephens says. “Our RAL relationship is a vital part of our sponsorship portfolio and the Subaru Top Weekend on the mountain is a highlight on our calendar every year,” she says. This year Subaru’s Top Weekend will be held over September 1st and 2nd at the Turoa ski area. Two hundred of the top carparks will be reserved exclusively for the drivers and occupants of any model Subaru - making a weekend of skiing, boarding or playing in the snow even more appealing. “We will be celebrating our 20-year anniversary at Top Weekend so lock the dates in your calendar and check out our Subaru Facebook page for updates as we get closer to our event. Our team will be on-site to treat the first 200 Subaru drivers to hot beverages and giveaways on arrival. We’re looking forward to welcoming Subaru drivers to Turoa this year for the first weekend of September and always enjoy seeing our All-Wheel Drive vehicles parked up in a premium spot on the mountain,” Mrs Stephens says. Tūroa General Manager JP Chevalier says that Subaru’s have stood the test of time across many snow-laden roads both in New Zealand and around the world. "Subaru is the perfect choice for both today’s families or the youthful-minded free-rider and freestyle skiers or snowboarders. Whether drivers purchase a Subaru to rally for kicks or handle that precious cargo of children in the back seat, Subaru’s safety rating is as good as it gets,” Mr Chevalier says. Mt Ruapehu's state of the art snow factory is in full swing pumping out snow, with Whakapapa ski field scheduled to open this weekend on Queen's Birthday Weekend, June 2. This means first timers can learn nice and early in Happy Valley and then progress throughout the season to make the most of winter. The combination of the snowmaking technology and a big boost from Mother Nature, which has recently blanketed Whakapapa Ski Area with snow, should make for fantastic early season skiing. Mt Ruapehu offers skiers, snowboarders and sightseers New Zealand's largest commercial ski areas and the longest ski season through to Labour Weekend in late October. It's also a unique ski experience set within a World Heritage park and on an active volcano. The next ski field scheduled to open is Whakapapa’s lower mountain on June 16, with Whakapapa’s upper mountain following on June 30 and then the Turoa Ski Area on June 29. Mt Ruapehu allows visitors to experience New Zealand's two largest ski areas - with just one lift pass. Mt Ruapehu - Whakapapa and Turoa Ski Areas - are home to the most natural skiing and snowboarding terrain in the country; huge snow-filled basins, lift-accessed backcountry, steep chutes, drop-offs and secret powder stashes. For the littlies (and big ones too) in the family, you can play in the snow or enjoy the free tobogganing area, a kid's centre (Turoa only) and beginner packages. Otherwise, relax in cafes and enjoy the great food and coffee, or take a chairlift ride for elevated views across the Central North Island and beyond.